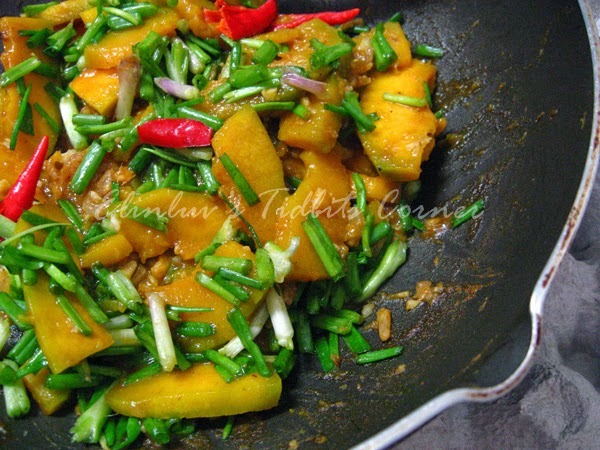 With surplus of homegrown spring onions, I tend to add spring onions to the dishes I cooked :p This is a hot and spicy pumpkin stir fry dish I cooked for dinner. Sometimes I do run out of ideas what to do with the pumpkin I bought from the supermart. My bad habit of always "Stock up first and think later " hahaha Anyway, back to this delicious spicy hot dish...it is easy to whip up and darn delicious okay ,though it may look simple but the taste is marvelous...every mouthful is addictive ! Added some dried shrimp and curry powder for extra oomph to the dish. 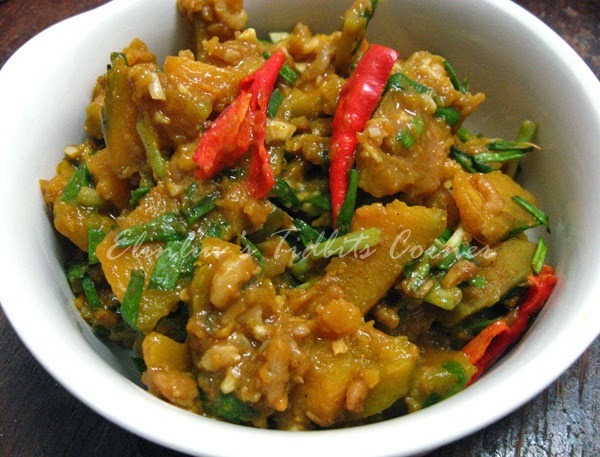 A great combination of flavor....hot ( from the bird eye's chillies, spicy from the curry powder ), sweet ( from the pumpkin ) and a faint scent of fishy-ness from the dried shrimp....hahaha tell me , can you imagine the taste of this dish ? Yea, it is a bomb! the flavor burst and explode in the mouth ! Heat up 1 tbsp of oil in non stick deep pan and saute garlic, pounded dried shrimps, chillies till fragrant. 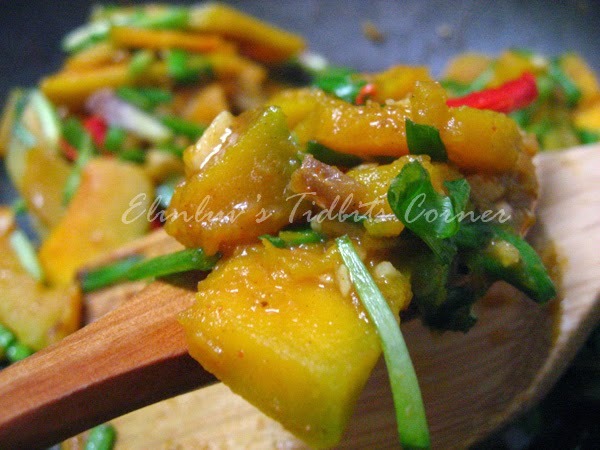 Add in curry powder paste and pumpkin slices and stir fry till well combine (3 mins ) add in 1/4 cup of water and close lid for a few minutes till the pumpkin is cooked but not overly soft and gravy has thicken. Add in spring onions and salt to taste , stir fry till well combined. Dish up and serve hot .